When you have a whole house to renovate, it can be kind of tough to decide which rooms to do first. I mean, it’s a pretty big to-do list but you eventually have to start somewhere, right? I basically tried to do our bedroom and front living room first so that we would have a finished space to sleep and hang out in. Good idea. I eventually started to realize though that while we had a good hangout area for guests, they were also most likely getting to see our guest bathroom while they were visiting, which was by far my least favorite room in the house. Once I had that realization, I decided that the bathroom should be next on the list for a makeover — for sure! You can probably see why the bathroom felt a bit depressing in the “before” stage. Brown walls, yellowed cabinets, stock mirror and light fixture… you get the idea. I just wanted it to feel brighter and have more personality. To be honest, I REALLY wanted to change the tile floor (it goes all the way into the shower/tub area), but it just wasn’t in the budget. I know it may look like a perfectly fine neutral tile to some people, but I really hate brown/tan, so it drives me kind of crazy! I just keep telling myself that it’s at least better than a really bright color that I hated, right?? I gave the existing cabinets a fresh coat of bright white paint (just untinted high-gloss white) and switched out the cheap looking silver handles with these beautiful simple brass pulls from Schoolhouse Electric. The bright white feels so much cleaner with the pretty brass accents, and it creates a nice contrast with the existing black stone countertop. It was really hard to find a long bathmat runner that was the right length for the room, but this black and white runner fits perfectly and adds a little more pattern to the space as well. I always like to keep cotton pads out for nail polish removing, but it’s nice to have some cute canisters (from Target) where you can hide those types of bathroom items. A gold soap dispenser doesn’t hurt either! The original bathroom light had a single light centered over the mirror. That’s not really my favorite placement to begin with, and I couldn’t find a light that I liked for that configuration either, so I thought it would be worth it to move the setup around a bit. I had the existing light box removed and covered over and two more added so the lights would be on either side of the mirror. That giant mirror was glued to the wall (pretty common so they won’t fall), and so I had to have it broken off the wall and the wall patched before I could paint anything. Even though it cost a few hundred dollars to do, I am so much happier with how it looks now. It was definitely worth it! I knew if we were removing the old mirror, I would obviously need another one. I chose this simple round mirror to replace it and I really love it! It’s simple and clean and the black rubber edge helps balance out the black countertop too. I wanted the new lights to be sleek with a touch of gold, and after hours searching online, I thought I’d give these sconces a try. I like that they fit the gold and white trend but have a different shape from what I’ve been seeing lately — YAY! To compliment the brass pulls and lights, I found an inexpensive gold faucet. I was a little worried because I know other people that have had terrible plumbing problems with cheap faucets, but ours seems great so far! For a touch of color (and to break up the wall print a bit) I hung this vintage-looking art print. Of course being the matching nerd that I am, it makes me so happy that the blush in the sunset just happens to match the towels perfectly. GIVE ME ALL THE MATCHING! I am still obsessed with these DIY lucite towel holders from a few weeks back. They were probably the easiest DIY I’ve done in the whole house yet one of my faves. Don’t you love when that happens?? Credits // Author: Laura Gummerman. Photography: Laura Gummerman and Elsie Larson. Photos edited with A Beautiful Mess actions. Okay, I HAVE to ask. How do you keep your cats from eating plants around your house? I love the look of the air plant with the canisters and soap dispenser, but I know it would be a goner in less than an hour if my cat had anything to do with it. This dream of black, gold and white looks simply stunning! I especially love the eye decoration on the walls. I have some white tiles, maybe I’ll paint something on them as well. Thanks for the inspo! Super cute & I love how you’ve settled in!!! How are the painted hinges holding up? We are planning on painting our kitchen/bathroom cabinets and they all have exposed hinges! We don’t want to spend the money on replacing them but I’m afraid they will look worse if the paint gets worn down! Thoughts? Great job! Love how the mirror brings it all together. Amazing how just changing the hardware on the cabinet made it look better. Not loving the pattern on the wall though; looks like spiders!! Love it all except for those eyes on the walls. At first glance I thought they were spiders and did a double take. Otherwise it’s a lovely room. I would probably do a black and white or a grey and white stripe on the walls, or perhaps only on one wall. I LOVE LOVE lovey-lovely love-glove-dove this room. SO much. Laura, it’s a very cute room. My style is not like yours (all the browns!) but I really like how you have a streamlined aesthetic and the ability to stamp everything with your ‘signature’ so to speak. I keep going back to your house photos again and again because I really want to copy your ability to have rooms flow and the house to be cohesive! I loved the tile in your bathroom too, but would you ever consider painting it? Is that too much work? It looked so cute in your kitchen but maybe on floors it looks monotone. Since grout lines are my nightmare, at least you’d never have to clean those! Great work though – the room looks amazing, and you really did a beautiful budget makeover! Could i please vacation at your house and sleep in your bathroom?!?! This is so gorgious! Loving the wall design! Stellar post! This room looks fantastic, such a gorgeous makeover! Wow!!! Love it! It’s amazing how some new walls, new fixtures, and a new mirror can spruce up a room!! love this bathroom! It’s so quirky and chic at the same time! I’m totally with you on buying a house and having so much to do and no idea where to start. We did our guest bathroom first as well as it was totally hideous. I posted the renovation below if you want to check it out. It’s a little dark still but I’m much happier with the final result! I love the gold fixtures she used! They’re so pretty and give it such a modern look! This is such a beautiful change…I love reading posts like this and seeing the before and after… it really is just the smallest changes that make all the differance!! Really beautiful Laura. You have such an awesome rockerish/fancy vibe going on. I always love your posts. And you have inspired me to really start liking light pink. Can’t wait to see more of your space! Some plants are fake around the house (especially the hard to reach ones) but they don’t really care about plants, just treats, so they don’t bother the plants at all. Sometimes they dig in the dirt though! What a totally fun wallpaper for a bathroom! Oh my goodness PLEASE come and decorate my home! I am so obsessed with this blog, these rooms are looking beautiful. I’m so jealous, student problems! What a big improvement! I especially love the rug. The first thing I noticed are the floors, though, because our bathrooms have very similar tile. It might even be the same tile, and I’m with you–yuck! We can’t afford to replace ours yet, either, so I sympathize. Just tell yourself that no one else who visits your home will notice the floor as much as you do. Same! As soon as I saw those I was thinking of all the comments people would make about being watched in the bathroom. I think my hubby’s friends would find it especially, uh, charming. Your renovation looks great! Good job! Aw, thanks! And light pink is the best!! It’s true, but I notice it for sure!! YOU GUYS! There is no right or wrong in decorating. It’s ok to have your own taste, but using words like “creepy” or “distracting” is super rude. This isn’t just a project for your to critique, this is her actual home that she’s inviting you into on a tour. I love the transformation. However, I’m not a fan of the eyes on the wall – though, they are a quirky/interesting feature. I love what you did with your bathroom Laura. Especially the pattern on the walls.. Can’t wait for the DIY!! How did you paint the cabinets? Did you have to stripe/sand the originals? Everything always looks so nice but I have noticed that you often paint everything white. Personal taste of course but it just seems so sterile to me. Like a surgery or Dr.’s office. Love this. You can really transform a space. I love that you have a definite style. It’s very cool seeing something and immediately knowing its one of your projects. 🙂 and pay no mind to the mean comments about your wall. So rude, especially after you said it was one of your favorite parts of the room. I think it’s great! amazing job! i love the runner in front of the vanity. Guh! So beautiful! 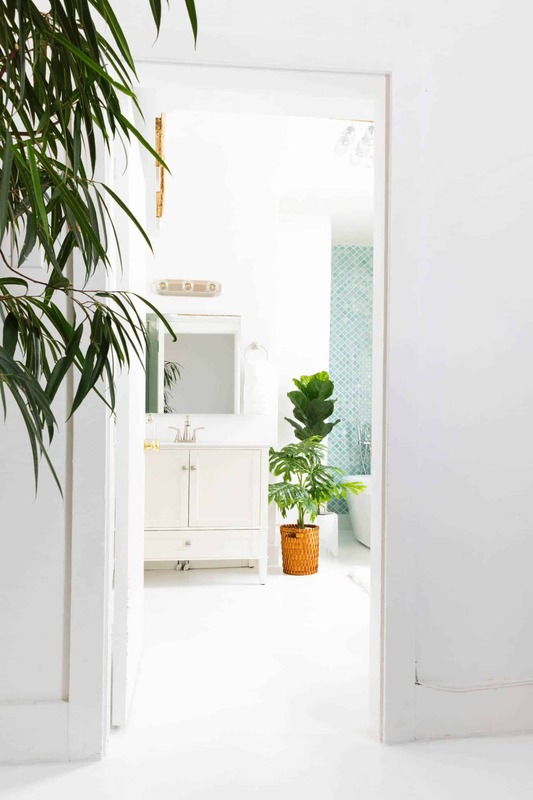 It’s amazing how white paint can really brighten up a space and I am just in love with the round mirror! I thought the eyes were spiders too. I think the eyes on the wall look really cool and kind of Aztec. It never even occurred to me that they could be seen as ‘creepy’! This room is lovely! I happen to like those eye details. It’s quirky but makes the space all the more interesting. Love it 😀 your house has so much personality. It’s beautiful. ooooo I love the finished look, the gold detailing is amazing! So did I. But I love the rest. Painting the hinges made them disappear. I didn’t notice them till I read a comment someone else wrote. Great job on your bath. Wow! The difference is outstanding! I love how all the colours are complemetning each other. The desing looks so ‘fresh’ and girly at the same time, love it! when will the eye pattern post be up? I’m dying to try it! Such a wonderful makeover! I love it. And I totally get your feelings about beige/tan tiles. I had them in my bathroom, too. 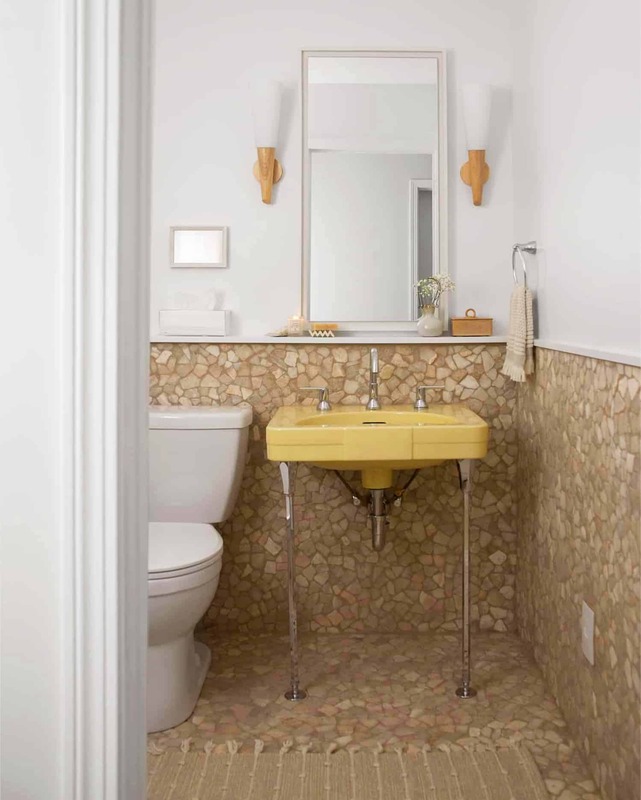 I used up the tile paint from my kitchen-reno in the bathroom – and it worked on the floor, too! So far, it held up to the daily wear. Ok, so I know this is a late comment, but when re-painting cabinets like this, did you have to sand them in place and then paint? Or did you just paint over what was there? I have a cabinet I want to repaint but the material is wood but a bit glossy.